New Australian poster for David Fincher’s 'THE GIRL WITH THE DRAGON TATTOO'! David Fincher's upcoming adaption The Girl With The Dragon Tattoo has a new poster which emerged down under. 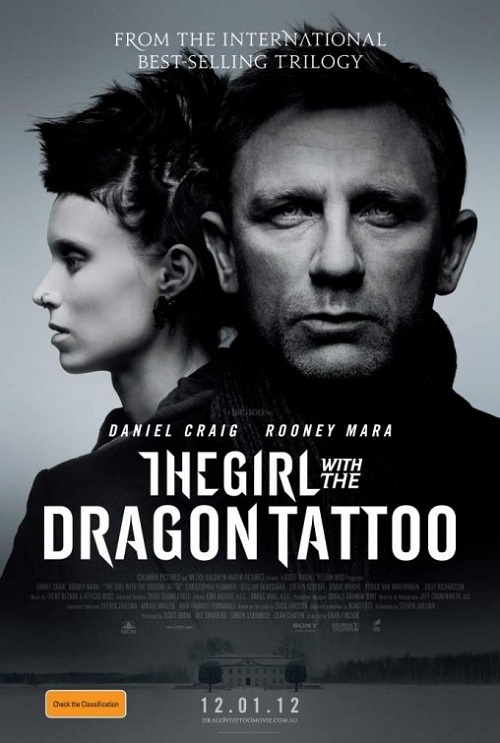 The movie, based on Stieg Larsson’s hugely successful The Girl with the Dragon Tattoo novel, the first book in the authors Millenium trilogy stars Rooney Mara as investigative hacker Lisbeth Salander & Daniel Craig as Mikael Blomkvist, investigative journalist & publisher of Millenium magazine. The Girl with the Dragon Tattoo also stars Robin Wright, Stellan Skarsgård, Christopher Plummer, Joely Richardson, Steven Berkoff, David Dencik, Yorick van Wageningen, Bengt C.W. Carlsson, Mathilda von Essen & Goran Visnjic. The movie hits theaters this December 21st. I'm reading: New Australian poster for David Fincher’s 'THE GIRL WITH THE DRAGON TATTOO'!Tweet this!